Of course, I started with something “big” instead of a small seat cover – that’s my nature…just go for broke. The worst thing that could happen would be that it looked terrible and I’d have to scrap it or bite the bullet and get it reupholstered. Here’s what it looked like when I bought it. I got from a lovely husband and wife who were moving the next day to Chicago and so I was in a position to get it at a pretty good price. I’m not the best bargainer but I got this loveseat, 2 wing chairs and a coffee table – for $150. Not too bad. I originally bought this furniture for home staging purposes and I did use the loveseat the following month in a house that I staged, so it came in handy. 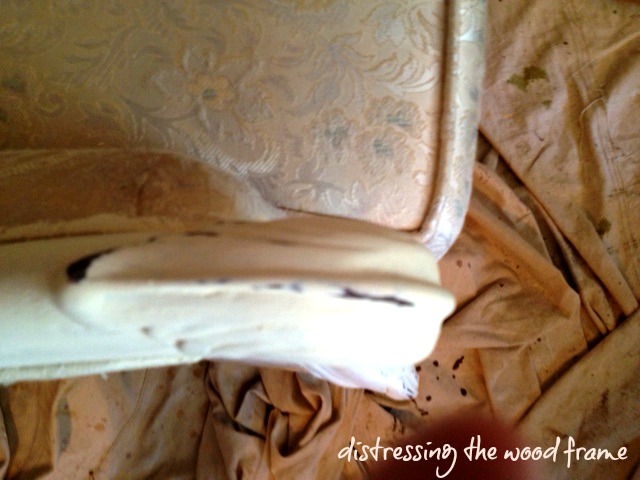 But I hated the look of the dark wood and the shiny (cheap) damask patterned fabric. 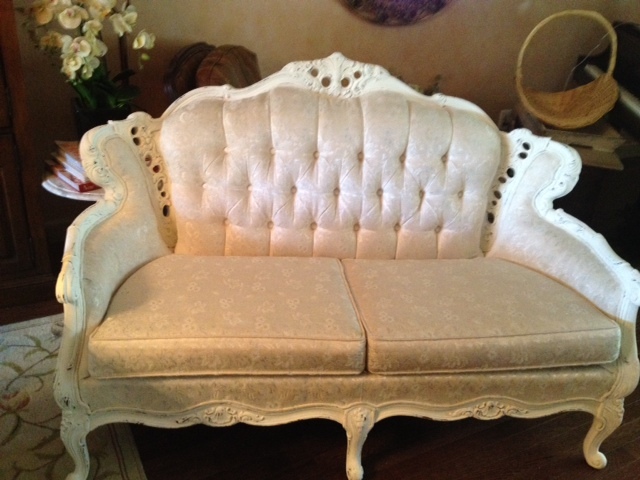 I knew that this loveseat could look great if you lightened up the dark wood and added beautiful linen upholstery. That would cost $$ – maybe $800 or more with fabric…and that was just not in my budget at the time. So, the piece sat in my storage unit after the house was sold. 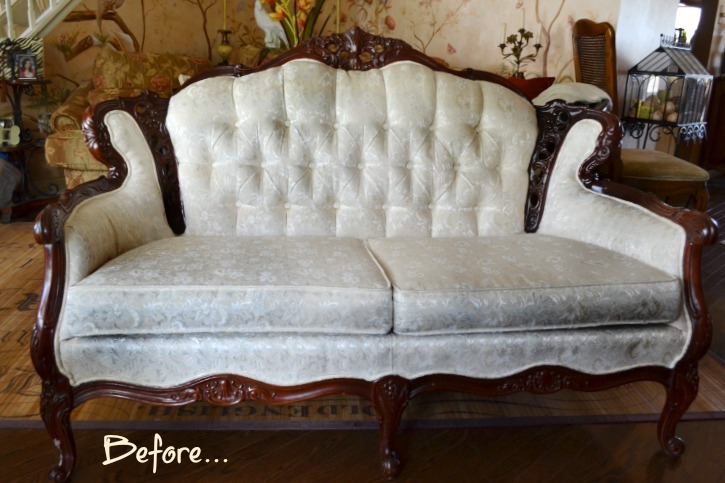 A few months later, I thought I would just start working on this poor little loveseat, so I brought it back home. 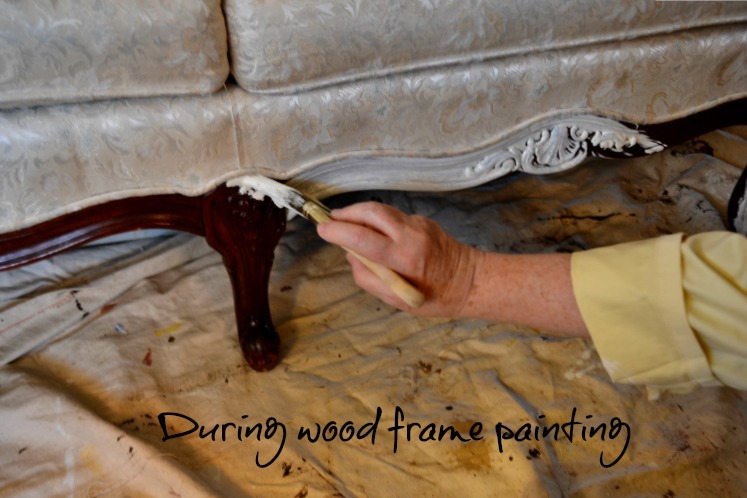 I started with just painting the dark wood with Annie Sloan Old White Chalk Paint and distressing it a bit first to see if that could improve it – and it did. I kept it in my house for a year or so like that and it came in handy when we had holiday dinners etc as extra seating in the dining room. Two of my kids would sit on it at the end of the table – and my husband and I had two seats at the other end…and then I could fit 10 side chairs around the table – easy seating for 14. First, I vacuumed the piece and I tried once again to get any soiled bits clean. I took a spray bottle and wet the surface area of what I was painting first. I did try (on the underside of one of the cushions) a full strength mix at first but I felt that that left too much of a thick chalky finish so I switched to adding about 40% water to my Chalk Paint mix. 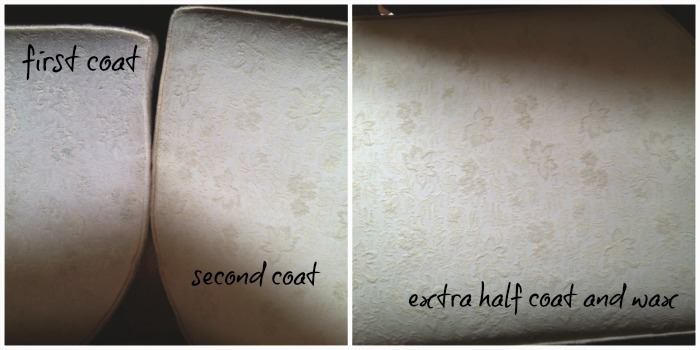 You want to scrub the Chalk Paint into the fabric – let it get absorbed. Multiple light coats are better than heavier coats. After it was dry, I took a medium sanding block and sanded the fabric a bit. It helped to get it smoother. Before putting the second coat on, I sprayed the surface with water again. It goes on smoother this way. You may need to spray while painting as well – I did. It helped to spread the mix on the fabric better and helped even out the coat. I sometimes had to sand again, if there was any pilling of the fabric. You may or may not come across this but I was working with a slightly textured inexpensive fabric that tended to pill even without the Chalk Paint on it. I had to go over some areas that had a blue coloration on them – they didn’t seem to want to go away so easily! But – all in all they were not that noticeable. 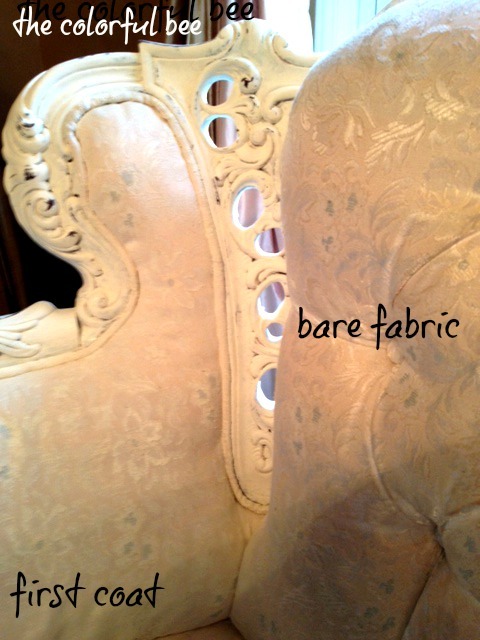 I let the painted fabric cure overnight and then I waxed it with Annie Sloan Clear Wax. I buffed it a bit after about a half hour after application. I noticed that the fabric became so much softer – not stiff at all (which it was before waxing). The wax helps to bring it back. Some people who have done this method say their fabric looks like soft leather. Mine didn’t really take that soft leather look. It just looks so much better…cleaner and newer than it did before. Don’t be afraid of trying this. It’s time consuming (at least on a sofa or love seat!) but on a small chair or seat cover – it won’t take you very long at all to do. So, if you have something that’s been sitting in your garage or your house and you hate the upholstery – try it. With a small chair you could even do it with one of the sample sizes that cost so little. My advice – try it! You have nothing to lose…except a little time, a little money and some elbow grease. 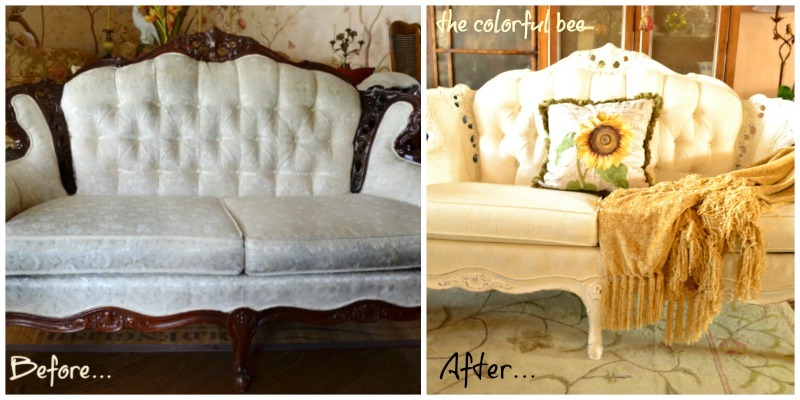 This entry was posted in Annie Sloan's chalk paint, Home Staging, interior design, Makeovers, Paint, Tutorials and tagged Annie Sloan Clear Wax, Annie Sloan Cream Chalk Paint, Annie Sloan Old White Chalk Paint, antiquing furniture, painting and distressing moldings, painting on fabric, transforming a loveseat, using Chalk Paint on upholstery. Bookmark the permalink. I enjoyed reading about your experience with this piece. I have painted a few pieces, too, just not with chalk paint on the fabric. (I’ve lacked a piece that I could experiment on). 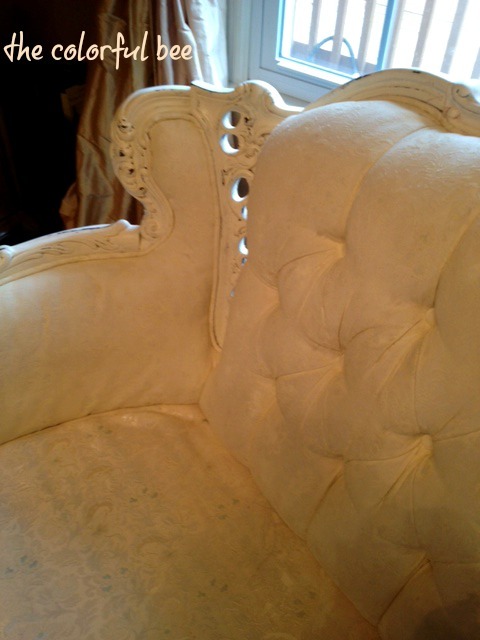 I did use chalk paint on leather, and I tried the Design Master spray on fabric (it is meant for florals). I had a good result with both. I am right now sitting on an inherited French style sofa from the 1950s, and I have really wanted to try this. Now I might. The fabric looks rather similar to what is on your piece, and this gives me hope that it could actually work! I keep a slipcover on it anyway because it is in my kitchen and things get spilled occasionally, so if it looks bad, I could just put the slip back on. 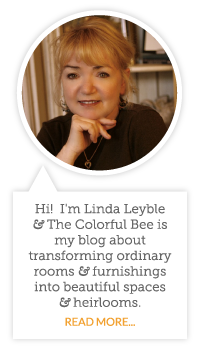 What a great blogpost you wrote this week. What a gorgeous store in Louisiana. I wish I could be there right now. 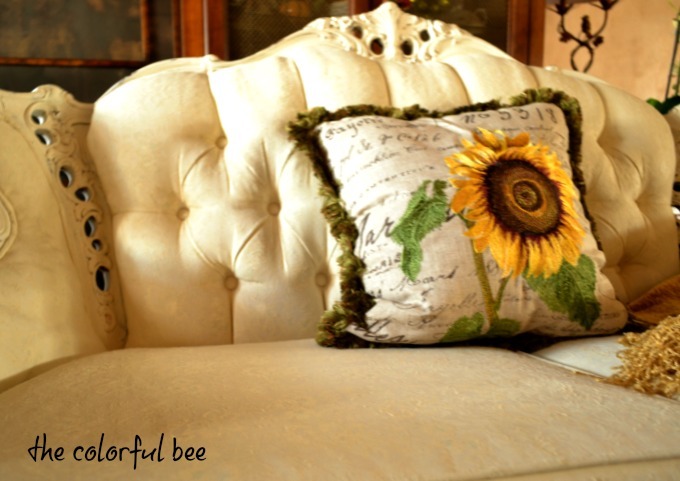 So glad that I gave you some courage to try chalk paint on your fabric like mine. Give it a try. Let me know how you do!! What a beautiful transformation! I’ve painted florals on fabric before, but never thought about painting an entire piece. In my mind, it would remain stiff, especially using chalk paint. I didn’t think you could sand or wax it, and get better results! Enjoyed the blog very much. I have been wanting to paint a chair.